- Badger Adult Razor Jacket. - 100% Brushed tricot polyester, White piping shoulder and sleeve detail. - Two front pockets, Open bottom with bungee cord and toggles, Covered elastic cuffs. - Embroidered Badger logo on left sleeve cuff. 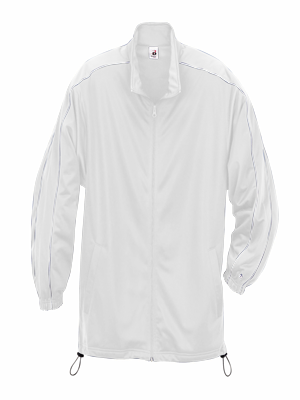 Badger Adult Razor Jacket. 100% Brushed tricot polyester, White piping shoulder and sleeve detail. Two front pockets, Open bottom with bungee cord and toggles, Covered elastic cuffs. Embroidered Badger logo on left sleeve cuff. Sizes XS-4XL. Colors: Black/White, Forest/White, Graphite/White, Maroon/White, Navy/White, Red/White, Royal/White, Silver/Graphite.